Competitive Gaming On A Budget – Can It Be Done? FNATIC And AMD Say YES! Pro gaming on a budget. 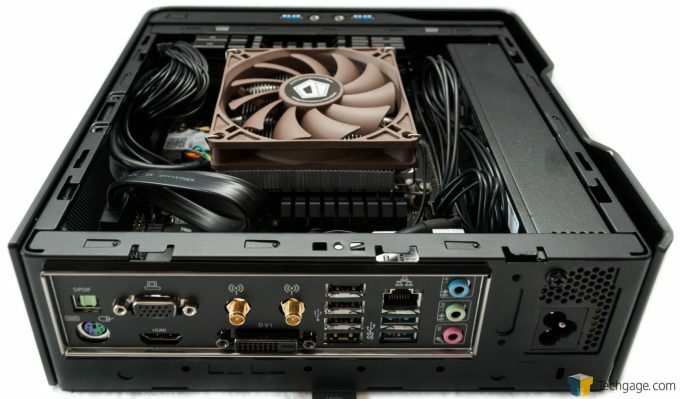 With help from AMD and FNATIC, a compact LAN party PC was put together, capable of 1080p gaming for just $500. With eSports taking off in a big way, you don’t always need ultra settings to pull off a 360-no-scope. 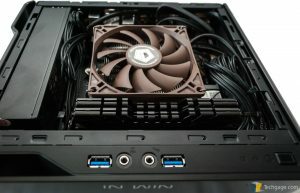 We take this FNATIC sponsored system for a test drive and find out just how much gaming you can pack into a tiny PC with the help of AMD’s APU. Competition gaming is exploding in popularity all over the globe. Manufacturers are working with teams to churn out team branded gear including mice, keyboards, chairs, and so on; not to mention corporate sponsorships. AMD is the official processor sponsor of FNATIC, providing the team with powerful processors it can trust in its professional gaming competitions. Today we are taking a look at a FNATIC approved $500 AMD eSports Gaming PC, a small form-factor gaming rig that promises to give you the ability to competitively game without spending the big bucks on massive GPUs, liquid cooling, and so on. FNATIC is a leading professional gaming organization in the eSports world, with teams playing games such as League of Legends, Dota 2, Battlefield 4, and more. FNATIC attends more than 75 international events per year in every corner of the globe. FNATIC has over 2,000,000 followers on social media, and its YouTube channel is over 100,000 subscribers strong. This will undoubtedly raise a few eyebrows, as I admit I was a little suspicious whether you would actually be able to seriously game without a dedicated GPU. CPUs with integrated graphics have come a long way, and you are hard pressed to find motherboards nowadays without integrated video. There is an obvious push by the industry to integrate graphics. Years ago, it was common that the higher end motherboards didn’t have integrated graphics, but again, not the case these days. The question is, can you game at the level of the competition gamers, without dropping a bundle? Can you get enough power into a small form-factor that is smaller than a 6 pack of beer? Let’s take a closer look at what AMD and FNATIC have come up with. Now you hardware nuts like me are already looking at this list and coming up with areas where you could have saved a few bucks here, and splurged a little more there and still stayed in budget, but this is what we have here, and this is all very, very decent gear. I should note that this excludes the cost of the OS, which will set you back another $80-$100. This case is small, very small. 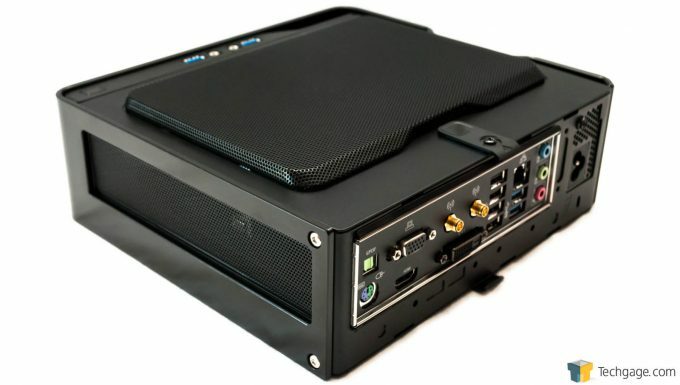 It measures at 9.6” x 3.3” x 8.6” includes a 150 watt PSU, and weighs in at a mere 5.5 lbs. This case is all black, and is a combination of steel and aluminum, and has a really handsome, minimalist styling. 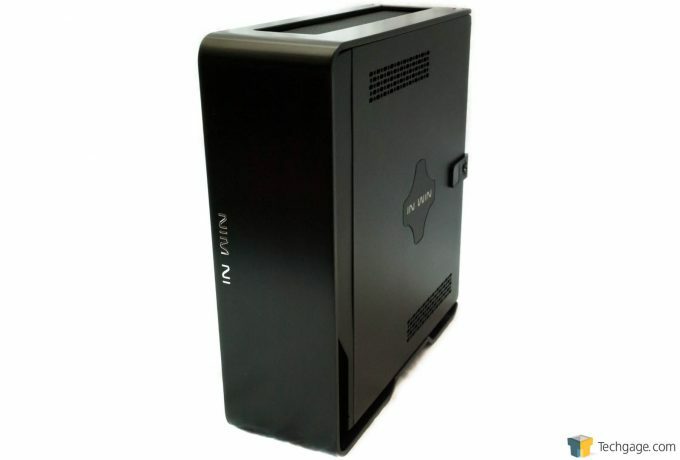 You are somewhat limited as to what CPU heatsinks you can use, as you only have 43mm to work with from the CPU surface to the top of the side panel, and this is a Mini-ITX only case. 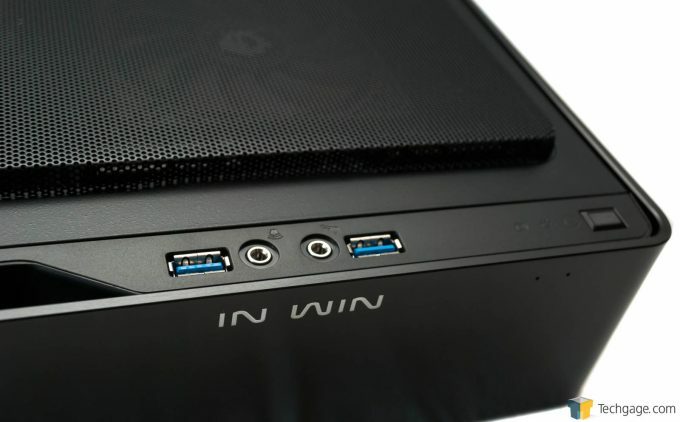 There are two USB 3.0 ports, 3.5mm headphone and microphone jacks on the top. 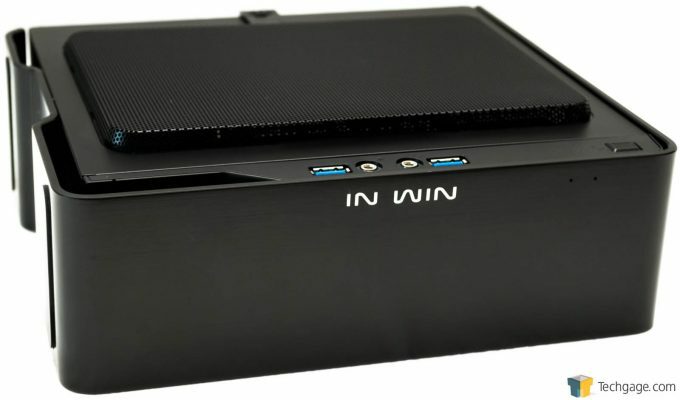 IN WIN claims you can stand this case up on the supplied feet, or lay it flat, but I found there were no feet on the flat bottom, and I was afraid that the bottom vents might be starved for air if I set it flat. This is corrected easy enough by buying some generic rubber feet that you can buy just about anywhere, but it works just fine standing on end. On the backside of the case we find the IO shield, and the power connector. One nice thing about this form factor, is that the PSU is all internal, so no external brick, just a power cord. Inside, everything tucks away neatly and tightly. Because of how small the case is, the CPU cooler appears massive; taking up a lot of real estate, but the cover fits it perfectly, no contact with the lid whatsoever. On the underside we find the SSD tucked away neatly into its own slot. There is room next to the SSD for a standard HDD if you were so inclined. The most obvious limitation with this setup is: very, very limited expandability. But let’s face it, the point of a build like this IS minimalism. This isn’t a rig you are going to be changing much, partly because you are so limited, but also because this is something that is very purpose-built: the LAN party/competitive gaming event. This fits nicely into a backpack, and is very portable, and that is the main appeal to something like this, not to mention the price. FNATIC and AMD really wanted to show that you CAN game like the professionals and not drop a lot of cash, and do so in a small convenient form factor. I played a few different games on this machine, and also used it as my HTPC for a while. Firstly, as a HTPC for watching movies and TV shows on, and maybe using a NES emulator on or something lightweight like that, you can do a lot better. You can spend less money and produce less heat. But, the purpose of this machine is not a HTPC, so let’s move on. CS:GO – I played quite a bit of CS:GO on this machine. I had to keep my settings less than maxed, but this machine did handle CS:GO quite well at 1080p. AMD and FNATIC claimed to be able to achieve 70fps at 1080p in CS:GO, League of Legends, and World of Tanks, and I found this to be the case. Game play was a lot smoother than I expected. Every PC I have ever had, has had a separate GPU, so I was really curious to see how this PC worked without a GPU. If you are after playing a very specific set of games, like the older ones such as CS:GO, the graphics workload is pretty lightweight compared to other newer games. Just for fun, I played the new DOOM on this machine, and it was pretty rough… pretty rough indeed; even with all the details on low, it was essentially unplayable. Again, games like DOOM are NOT the intended workload of this PC, but I was curious to see how this machine would handle something seriously graphics intensive and it was about what I expected: abysmal. In closing, If you are playing these older games that don’t require a lot of heavy lifting for the graphics (compared to modern games like DOOM for example) then this is a really cool build. It literally fits under your arm, and is no bigger than a dictionary. It takes up almost no desktop space. The PSU is only 150 watts of output, so it’s not going to be taxing to your energy bill at all. The point is, yes, you can build a gaming rig that will allow you to easily, and affordably game with the “big boys”. 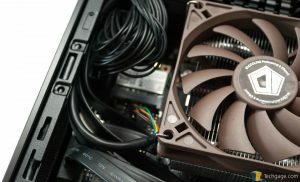 If you are looking to do this, and keep a ridiculously small form factor, then you should certainly look into building one of these for yourself!